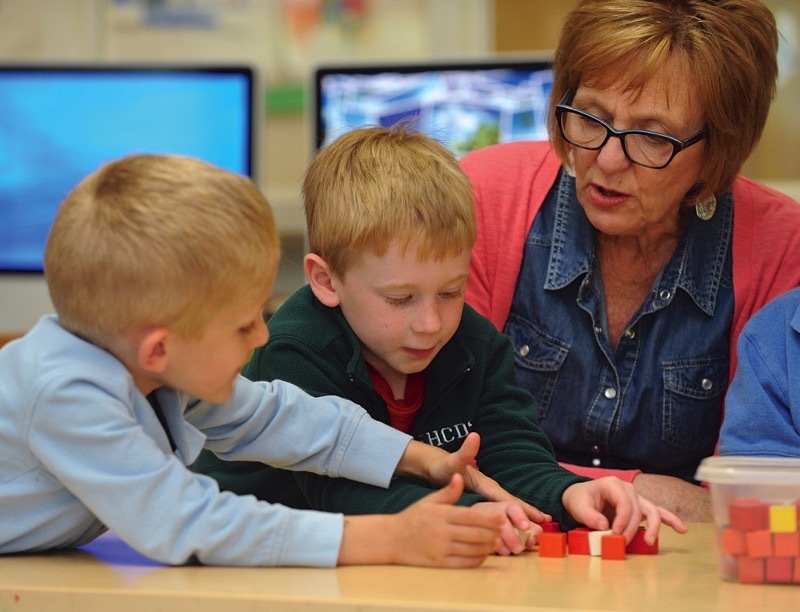 In the Lower School, we carefully, intentionally cultivate the genuine and lifelong love of learning. Students build strong fundamentals such as reading, writing, and math, but blended with relevant life skill principles such as relationship building and social problem solving—coupled with an introduction to the concept of accountability. What are Grade Level Objectives? Grade Level Objectives are a purposeful sequencing of academic expectations. They describe what students are expected to learn in a school year. Curriculum is developed around Grade Level Objectives and teachers structure, sequence, and plan their lessons to meet these objectives. find sums and differences, reading and writing the symbols +, -, and =. Using estimation as a tool for prediction, students collect and organize data in tally charts, tables, and bar graphs. They continue to identify and extend simple geometric and sequential number patterns as an introduction to algebraic reasoning. As they develop the vocabulary to express concepts of geometry and spatial sense, students name and describe attributes to compare objects according to length, weight, and size. With language arts for kindergarten children, our focus is on phonological awareness (identifying sounds in spoken words), the letter-sound associations of the alphabet, and language use (appropriate word order and sequence when asking a question or making a statement). Students continue to develop listening skills (listening for a purpose and understanding multi-step instructions), an understanding of the mechanics of reading, directionality, and identifying the parts of a book, including the author, illustrator, and title page. Students also read poetry, fiction, and non-fiction and compare similarities and differences among authors, characters, and stories. They also produce personal responses to literature through writing, stories, and narrative poetry. In addition, the answer questions about books read aloud in class and learn to distinguish between a comment and a question. Students identify their first and last name, recognize all upper-case letters and most lower-case letters automatically. They learn to determine the meaning of vocabulary through context and picture cues during read-aloud and shared reading experiences, and they write a complete thought using a combination of phonetic and standard spelling. Students also carry out multi-step directions, and print upper- and lower-case letters of the alphabet and the numerals zero to nine using standard form, proportions, and spacing. In addition, students develop an understanding of letter and sound relationships as they listen to and sing familiar songs and rhymes to promote language development. And they begin to read simple texts and speak clearly with appropriate volume and voice for specific audiences and environments as they re-tell, re-enact, and dramatize stories. During their Lower School years, students learn the basic principles of computer use, network organization, and word processing functions. They experience numerous opportunities to practice various technology tools, software, and computer programs that will help them build their foundation of skills, including reading, thinking, communicating, problem solving, and computing. Lower School students also learn to use technology and media to bolster their skills to collaborate and communicate as well as to access and evaluate information. Kindergartners are also encouraged to use the library and other media to develop their reading skills. Stories covered include A,B,C books used to strengthen familiarity with and manipulation of the alphabet. Students learn the meaning of author and illustrator and their roles in the creation of a book. To build cultural awareness, kindergarten students listen to stories that take place in other countries. They also listen to poetry as well as fiction and non-fiction stories. Kindergarten students also enjoy participating in independent book selection. And our Accelerated Reader program begins in kindergarten. Students at this level also use a variety of computer programs and applications to build and reinforce math, keyboarding, and graphing skills. And they use technology platforms, such as Smart Boards, to reinforce the skills they are acquiring in language arts. In term three, students explore websites as an introduction to the Internet. Each class will study a different part of the school and will be responsible to explain and teach the other classes about their discoveries. The skill sets of observation and recording, problem solving, mapping, and documentation will be employed throughout the school year. Kindergarten science reflects of the natural curiosity of a child. Using the five senses, students will strengthen their skills of observation and understand how each sense provides a different piece of that observation. They will interpret and record their findings in a scientific manner. Integrated with our social studies program, concepts in science will also focus on the use of both renewable and finite resources as we explore the school environment. The entire school community from PreK through grade eight will be expected to be responsible citizens who develop an awareness of problem issues regarding sustainability and seek to solve them. Kindergartners will explore the issues of sustainability through hands-on exploration of our physical environment. The studies will be child-centered and directed by teachers. The studies will also be interest based, driven by the questions, explorations, and observations of each individual classroom. Therefore, the three kindergarten classes may each be exploring a separate issue pertaining to the sustainability of our school environment. Possible studies include: how we get our water at the drinking fountain, how the boiler works, and what type of materials are used on our building and why. We enlist the help of the school architect, engineer, maintenance staff, and science teachers to enable to us further our studies. In kindergarten, students continue to study the Chinese culture and begin the study of Spanish with an emphasis on listening and speaking skills. Our Spanish curriculum supports the natural curiosity of the five-year-old by using concepts from the science curriculum to form a context for the study of Spanish vocabulary. Kindergarten students perform with different rhythmic patterns as they add classroom instruments to poems and songs. They also study various composers and instrumental families of the orchestra and sing many songs that provide opportunities to learn to sing in tune. And they study Orff instruments (xylophones and metalophones), which are wonderful tools for creating music and feeling successful. In music and movement classes, young students explore their gross motor movements and respond through movement to music of various forms, tempos, meters, rhythms, dynamics, cultures, modes, genres, and styles to express what they hear and feel in works of music. Students also learn musical terms and the relationship of notes on the grand staff. From this foundation, they are able to use the music software, “Music Ace,” which establishes a positive learning environment for creating music and enhancing listening skills for pitch. Students also document all they have learned by creating a music book. In addition, they have the opportunity to rehearse and perform with a full singing voice at three of Far Hills Country Day School’s most time-honored traditions: the December Holiday Concert, K-5 Closing Exercises, and the Kindergarten Diploma Ceremony. In Kindergarten, students identify primary and secondary colors, differentiate between “alike and different” and “many and few,” give order to arrangements, identify variations in darkness and light, arrange objects in formal and informal balance, create texture in form, give expression to the faces of people, and understand repetition in works of art. Kindergarten students continue to enhance the development of their spatial awareness as they focus on developing gross and locomotor skills, creative movement, and listening skills (especially following directions). Cooperative games are introduced at this level, and hand-eye coordination and flexibility are emphasized. The challenge course continues. To further develop their number sense, first grade students compare order and begin to estimate using whole numbers up to 100. Students learn to think of whole numbers in terms of groups of tens and ones. They also read, write, and model with the use of manipulatives and whole numbers up to 1,000. Basic fractions are introduced, emphasizing part-to-whole relationships. The students extend their knowledge of operations as they develop an understanding of addition and subtraction, which includes learning strategies for basic addition and subtraction facts as they compute sums and differences at least to twenty. Students also learn to recognize, describe, and extend number patterns, use the commutative property of addition, and apply discrete data in graphs and charts. Measurement studies continue as first graders compare and add values of coins and make estimates of measurement and time. They continue developing their geometry skills by composing and decomposing plane and solid figures, while building a foundation for such properties as congruence and symmetry. Students also extend their knowledge of algebraic thinking by reading, writing, and explaining the symbols < and >, and by describing and applying number patterns and the properties of number (i.e. odd and even). Students in first grade expand their understanding of the basic principles of computer use, network organization, and word processing functions. They find more opportunities to practice various technology tools, software, and computer programs that will help them build their foundation of skills, including reading, thinking, communicating, problem solving, and computing. They also expand their use technology and media to bolster their skills to collaborate and communicate as well as to access and evaluate information. In first grade, students continue developing their facility with technology while integrating drawing, reading, and writing skills as well as extending and reinforcing math skills and concepts. They are also introduced to the intra-school network and continue to use the Internet for guided and focused research. And they are encouraged to use various technology systems, such as desktop and laptop computers, digital video and photography, and Smart Boards, to suit a variety of academic tasks. First graders continue to experience ample opportunity to develop reading and listening skills by listening to a variety of stories and selecting books to take home. Each semester includes a study of an author’s books and life. In term two, students listen to many Caldecott-award-winning books. In trimester three, students “travel” around the world through pages of books, listening to stories from many other countries, comparing and contrasting various traditions and cultures, and examining characters and settings. With language arts for first-grade students, our focus is on extending phonological awareness (sounds in spoken words) by solidifying and understanding of consonant and vowel sounds, securing phonic skills (sounds and spelling relationships associated with words in print), and expressing and writing ideas in logical sequence. Students develop their listening skills and understand how to follow multi-step directions. They identify parts of a book, explore a variety of genres, make predictions, compare characters, understand the main idea, and identify story elements. They also develop multiple strategies for word identification. The program at this level emphasizes editing, spelling and vocabulary, correct punctuation and capitalization, presentation, grammar and usage, handwriting, formatting, research, and study skills. Students identify the number of given sounds in a word and develop the appropriate intonation and speed when reading aloud. They decode unknown words using a variety of strategies, recognizing that similar-sounding words can have different meanings (homonyms). They identify meanings of words using the root word and known endings, write using complete sentences, continue their development of conventional and phonetic spelling, and master grade-level high-frequency words. Students use new vocabulary learned by listening, reading, and discussing a variety of genres. They predict and recount stories to make meaning from texts and demonstrate their understanding. They produce personal writing and non-fiction pieces; construct basic story maps; interpret simple charts, graphs, and diagrams; recite poems, stories and rhymes; engage in role-play situations; and dramatize story elements. The overarching theme for first-grade social studies is “global communities.” The year begins by establishing a classroom community and developing an understanding of the economics of a community. The students learn the difference between needs and wants and how a community provides for them. The students learn how members of the community depend on each other, they begin to explore the idea of renewable vs. nonrenewable resources, and they develop an understanding about goods and services available in the community. A key concept for first graders is learning how things are made through a production cycle. In the third trimester, they apply their understanding about place and are introduced to research skills as they study one specific continent, Africa or Australia. They learn about the characteristics of its geographic features, its climate, its flora and fauna, and its people, including their stories, traditions and foods. In science classes in the first grade, each student takes care of an insect, providing it with food, water, and shelter. They care for and continually observe their insect’s structures, behaviors and transformations, and record these observations in a science journal. First graders also study the basic physical phenomena of light. They learn about the color spectrum by working with prisms, they use mirrors and water to discover reflection and refraction, and they learn how the eye works like a camera. Students also engage in a desert biome study that ties in to their other curricular activities. In Mandarin classes, first-grade students continue to develop cultural awareness, careful listening skills, and early literacy skills. They also learn basic words and phrases. In first-grade Spanish classes, the emphasis is on speaking and listening and beginning to read and write through the Santillana Spanish program. Students recite poems and sing songs to reinforce their studies. As students develop more sophisticated vocabulary, they learn to distinguish between genders, write phrases and simple sentences using basic structures and familiar vocabulary, and spell, punctuate, and capitalize correctly. Students also respond to and write modeled words and phrases using the correct word order. Students in grade one become musicians as they begin to read and comprehend rhythmic and music notation and attend music and movement classes. They continue to sing independently and in groups performing many of the poems that they read and study in their classrooms. They respond to the cues of a conductor and perform on both classroom and Orff instruments. They study the music and life of composers Sergei Prokofiev and of Franz Joseph Haydn. In term two, students learn the notes on the treble clef staff and compile a list of their 100 favorite songs as part of their celebration of the 100th day of school. Three musical performances round out the year in music: the Holiday Concert in mid-December; the First Grade Play in early May; and the K-5 Closing Exercises in mid-June. In art, grade one students recognize new colors by mixing them and learn about the influence light on forms, shape, values, and colors. They also learn to achieve balance in artwork, join objects together using various materials, use the overlapping technique as a method to create the illusion of depth, communicate non-verbally through illustration, recognize the warm and cool aspects of color, and analyze the similarities and differences between two works of fine art. First grade students perform in a play that involves music and acting. They focus on the skills of vocal projection, diction, eye contact with audience, and memorization. In first grade, an emphasis on body spatial awareness continues. Children are encouraged to continue to develop their locomotor skills, participate in cooperative games, listen to and follow directions, and cultivate manipulative skills and rhythmic activities. Components of fitness are introduced through Tai Chi, Yoga, dance, and fitness stations, which work all the different muscle groups and incorporate cardiovascular activities. The challenge course continues. Second-grade children develop an understanding of the base ten numeration system and place-value concepts to 1,000. They use place-value and properties of operations to write, compare, and order multi-digit numbers by counting in units and multiples of hundreds, tens, and ones. Students are expected to make reasonable estimates for whole-number addition and subtraction by selecting, applying, and explaining appropriate methods for doing so. They also become proficient with a variety of efficient mathematical procedures, including standard algorithms for adding and subtracting multi-digit whole numbers. And they begin to apply addition and subtraction to basic fractions. At the grade-two level, students learn and apply a variety of problem-solving strategies and are asked to numerically represent a multiple-step word problem and solve it by computing accurately. They master addition and subtraction facts through 12 + 12. They use repeated addition, arrays, and skip-counting to model multiplication and they use equal-sharing and equal-grouping to model division. Second-grade students extend their data analysis skills to include verifying predictions and communicating results as they interpret data in graphs and tables. Second-graders also become proficient in measuring lengths and using this knowledge to solve the area and perimeter quantities of plane figures. They analyze and use number patterns (i.e., skip-counting) to extend their understanding of the properties of numbers and operations (i.e., multiples and factors). Through language arts teaching, second-grade students improve their writing and comprehension skills as they study, differentiate, and write about various genres, such as poetry, biography, memoir, fiction, and nonfiction. They learn how to analyze the elements of a story by referencing the sequence of events, identifying literary and poetic devices, inferring the meaning of story, predicting outcomes, and studying the element of character. Students continue to develop their writing skills as they write complete sentences expressing one main idea and distinguish between fragments and sentences through the appropriate use and understanding of subject and predicate. They write using vivid language and varied sentence beginnings, and they create multiple drafts. Second-grade students also use their knowledge of phonetics, developed through word study and analysis, to build spelling and vocabulary skills. They use appropriate rate, intonation, and pace and speed when reading aloud, and they interpret punctuation accurately. Students learn to recognize and apply basic spelling rules, use periods, question marks, and exclamation points consistently and accurately to end sentences, and use space on a page properly (name, date, title, heading). Second graders continue to build on the basic principles of computer use, network organization, and word processing functions. They experience numerous opportunities to practice various technology tools, software, and computer programs that will help them build their foundation of skills, including reading, thinking, communicating, problem solving, and computing. The students also learn to use technology and media to bolster their skills to collaborate and communicate as well as to access and evaluate information. The goals for second-graders are to strengthen the skills that lead them toward becoming independent library/media center users. Students hone strategies to direct inquiry and research. They practice evaluating and synthesizing information during research. Additionally, they use technology to process data and report results and use various technology systems, such as desktop and laptop computers, digital video, and photography, and Smart Boards, to suit a variety of academic tasks. Students also investigate the properties of geometric shapes and explore simulations in math, science, and social studies. In addition, second-graders practice language skills and fine motor skills, using various programs. They also learn about the home keys and proper keyboarding and typing skills. The reinforcement of mathematics continues throughout the year as students study geometry and fractions, graphing, solving equations, and arrays. In social studies, our goal for second graders is to encourage them to continue to deepen their understanding of the notion of community by exploring increasingly larger communities—i.e. classroom, school, town, state, country, and world—and understand how they are alike and different. Students are expected to understand the ideals, principles, and practices of citizenship in a democracy. Building on their understanding of the places from which their ancestors have come, students begin to experience the personal stories of those immigrants. They learn more about immigration and the reasons why people immigrate. And they learn about the customs and traditions that these special groups of people have brought with them to America and how they have changed this country. In a unique interdisciplinary collaboration with seventh-grade students, second-graders engage in a field trip to Ellis Island, discovering firsthand the immigrant experience in the United States. They continue to hone their understanding about how people, both in the past and today, make a difference in our country. Second graders end the year studying American heroes and build a hall of fame composed of heroes from New Jersey. They identify them as positive role models and explore their common characteristics. They also continue to strengthen their understanding of how people make a difference and how our core values are exemplified by these heroic people as well as those we meet in everyday life. Second-grade students study earth science with a focus on air and weather. They learn how to read thermometers and compare weather conditions using graphs. Students also learn how to measure length and distance in meters and centimeters and measure liquid volume. As part of their unit on life science, second graders learn the basic structure and function of the skeletal system, and through the study of Antarctica, they understand the states of matter, identify the adaptations of plants and animals, and identify food webs in the biome. Our introduction to the formal study of Mandarin begins in grade two and focuses on teaching basic ways of greeting, introducing family members, and counting and understanding numbers in Chinese, as well as learning action words and extending vocabulary. Students also learn body parts and colors and enjoy a celebration of the Chinese New Year. Throughout the entire school year, students use many visual signs and forms of body language to help them understand and master Chinese. Students practice Chinese through role play, small group activities, and games. For second-graders, the emphasis in Spanish continues to be on speaking, listening, reading, and developing reading and writing skills. Students recite poems and sing songs to reinforce their studies. They also continue to develop their vocabulary and ability to distinguish between genders, write phrases and simple sentences using basic structures and familiar vocabulary, and spell, punctuate, and capitalize correctly. Students in grade two become experienced musicians as they sing, perform, improvise, compose, and read songs using do, re, mi, so, and la and the notes of a C pentatonic scale. Second-grade students produce a class CD of their original songs and they perform rhythmic patterns with various notes and whole rests, using both classroom and Orff instruments in different meters. In addition, students demonstrate perceptual skills by moving to, answering questions about, and describing aural examples of music of various styles representing diverse cultures. They also study the music and lives of famous composers and participate in various musical performances throughout the year. Four musical performances round out the year: the Holiday Concert; the Second Grade Play; the Grandparents’ Day Concert, and Closing Exercises. In fine arts, our second graders learn how to use lines to separate objects or shapes and to create patterns. Students also learn to create the illusion of texture by imprinting and they deepen their study of colors using black and white to change color values. Grade-two students also learn to create a sense of depth with contrasts in various elements, create the illusion of space, and apply simple processes in weaving. And they are exposed to and learn how to recognize the variety of tools that artists use in the creation of their work. Second-grade students use masks in class and, working with third-graders, will present a pantomimed story to their class. In drama at the grade-two level, students focus on developing the skills of eye contact with the audience and members of the ensemble, stage movements, body movements, and memorization. An emphasis on locomotor and non-locomotor skills continue for second-graders and manipulative skills are further developed with fitness as the foundation. Students engage in an introduction to human anatomy as it relates to exercise. Cooperative games continue to be emphasized. Rhythmic activities, lifetime sports, and skills for playing on teams are all introduced. The challenge course continues. Third-grade students continue to extend their understanding of place value to whole numbers up to one million and they apply their understanding of number sense to writing equivalent forms of whole numbers in expanded notation. In addition to continuing their performance of paper-and-pencil computations, they are also taught to use mental computation through estimation by rounding numbers to the nearest 10, 100, and 1,000. An emphasis on mastering multiplication and division continues as students use representation (arrays, equal-size groups, and equal steps on a number line for multiplication, and repeated subtraction and sharing for division) to reflect mathematical notions. Third-grade students also memorize the facts 0 through 12 x 12 and are taught to understand multiplication and division as inverse operations. In addition, they are introduced to different algorithms to solve problems involving the multiplication of two- and three-digit whole numbers. They also learn to use fractions to represent parts of a whole, parts of a set, or points and distances on a number line and ruler. And they learn to use numerical expressions to find and represent equivalent names for fractions and compare and order fractions. Children in the third grade continue the study of measurement, using linear measures that call for more precise measures (fractional parts) than whole units. They develop an understanding of the perimeter of an object as a measurable quality and select units, strategies, and tools to solve perimeter problems. Students at this level also build on their understanding of data analysis by constructing and analyzing bar graphs, picture graphs, and line plots to solve problems. And they describe, compare, and classify two-dimensional shapes, as well as investigate properties of polygons and apply applications involving congruence and symmetry. As part of developing and mastering vocabulary, third graders learn the meaning of grade-level words and ways to correctly use them. They learn to recognize compound words, contractions, and common abbreviations as well as the multiple meanings of words. They also use a variety of prefixes and suffixes to understand unknown words. And they continue to learn more sophisticated ways to structure sentences through understanding parts of speech, parts of a sentence, and proper sentence structure. Students brainstorm and draft ideas in paragraph form, utilizing pre-writing as a strategy to move through the writing process and ultimately publish five to seven individual works. They edit and revise drafts to clarify the main idea, refine details and strengthen word choice, and reorder content, always using proper margin indentations, titles, and headings. Students learn to write a narrative paragraph with a topic sentence, supporting ideas, and closing sentence, and they increase their fluency with cursive writing throughout the year. They also learn to recognize and use proofreading marks to edit their work. They produce informational text and persuasive writing and they enhance their oral presentation skills, using appropriate props and strategies to prepare, rehearse, and deliver a presentation. They also listen to and follow discussions, contributing appropriately to support an opinion or clarify a point of view by using details, examples, and reasons. In their intermediate school years after having developed proficiency with the basic principles of computer use, students experience more opportunities to use technology to communicate, solve problems, and hone critical thinking skills. Students acquire more responsibility as digital citizens and engage in more opportunities to collaborate with others online and participate in online learning communities and experiences. Students also learn to use technology and media to bolster their skills to collaborate and communicate as well as to access and evaluate information. The students’ use of the library, technology, and media is integrated with classroom projects and lessons. Students use a variety of media and formats to communicate information and ideas to multiple audiences. Third graders learn to locate, organize, analyze, evaluate, synthesize, and use information from a variety of sources and media with increasing independence. They continue to process data and report results using an increasing variety of more sophisticated tools. Students’ use of technology and media expands at this level to include the selection and use of diverse applications, including word processing functions, graphing, and multimedia presentation platforms. Students also learn and practice safe, legal, and responsible use of information and technology by understanding of the meaning of plagiarism and the importance of copyrights, network etiquette, and Internet safety. In social studies, third-grade students bolster their map and globe reading skills as they focus the major portion of the year on an in-depth study of the United States. Students learn to examine the geographic regions of New Jersey, including the Pine Barrens, Shore, and Skylands regions, and gain an understanding of the unique contribution that each area of New Jersey contributes to the state's economy. They will also learn to locate the five main regions of the United States: northeast, southeast, Midwest, northwest, and southwest. To learn more about these regions and the states within them, each student chooses an individual state to study in more detail and researches, writes, and illustrates a four- to five-paragraph report on the geography, history, and economy of that state, as well as some its famous people and places. The third-graders present this report, along with diverse visual aids, and a brief oral presentation to the entire school community in the annual “Fifty States Fair.” Following the fair, students analyze the information they've gathered to discover similarities and differences between the states, and draw conclusions as to why the states are grouped in regions. Students studying each regional group will present their findings to the entire third grade. Through this intensive study and analysis, the students begin to understand that: each state has its own unique history and culture; each state uses its particular resources to create its own economic system; and groups of states with similarities in their use of resources and in their cultural and historical identities form the regions within our country. Students in the third grade will take part in a study of the Rainforest Biome and will learn to identify characteristics and adaptations of animal and plant life in the rainforest. They learn to locate tropical rainforests throughout the world and understand the water cycle as it pertains to the rainforest. They also research a particular animal of the rainforest, identifying its habits, diet, and social structure. In their unit on sound and hearing, students learn that sound is a form of energy as they predict how sound changes with instrument variables, such as length of air column, thickness, length and tension of strings, and other materials. They also learn the basic anatomy of the human ear. In their studies of plant propagation, growth, and development, students learn about the life-cycle of an angiosperm, understand photosynthesis, germination, and experiment with different forms of plant propagation through seeds, leaves, and cuttings. After reviewing their previous year’s studies, students begin their second year of Chinese language and culture by learning how to identify America and China on a map in Chinese. Students also learn how to identify one’s nationality, how to initiate and respond to questions about one’s name and the weather, and how to name the seven days of the week in Chinese. They also learn the names of animals, including the twelve Chinese zodiac animals in Chinese, and will begin to study the Chinese beliefs and traditions related to fruit. Students engage in short conversations in Chinese to introduce themselves, state their nationality and age, and use Chinese to express likes and dislikes with fluency by the end of their third trimester. In Spanish for third graders, equal emphasis is placed on speaking, listening, reading, and writing skills. Students begin to explore grammar patterns with commonly used verbs and learn vocabulary. They continue to develop their ability to distinguish between genders and they begin to write simple paragraphs and more complex sentences, using basic structures and familiar vocabulary. They also learn to spell, punctuate, and capitalize correctly. When reading Spanish, students learn how to identify characters and their roles and understand written instructions. Third-grade students begin the first trimester of the school year by playing the recorder, which helps them improve their note-reading skills. In term two, the students study state songs in correlation with their social studies unit about the 50 states in the country. They record one of these songs onto a CD and listen to it at their state fair. Their understanding of musical notation increases as they continue to study and experience the form and meter in music with traditional folk dances. In term three, third-graders make their first trip to the Midi keyboard lab, where they learn how an electronic keyboard differs from an acoustic piano. Students program the keyboard using three different sound banks to create music to enhance the mood of a poem. They also learn to perform recorder music on the keyboards and complete third grade with a CD compilation of their own original songs. Three musical performances round out the year: the Holiday Concert, the Third-Grade Play, and Closing Exercises. In grade three, students are taught to understand the concept of form and to recognize two-dimensional spatial representations, including depth, space, and scale. They also learn the relationship of the cone, cube, cylinder, sphere, and pyramid. Through their studies of all of these different forms, students learn how form affects function. When painting, third graders learn how to mix secondary and intermediate colors, tints, and shades. They also learn to recognize and apply balance in their work, and they learn how a sequence of images can tell a storyy. Third graders learn puppetry and, working with the second grade, present a story with puppets to their class. In this year of drama, students focus on the skills of vocal projection, inflection, and memorization, and portray a variety of emotions using proper diction and a microphone. In third-grade physical education, cooperation is emphasized. Fitness, including endurance/cardio, flexibility and strength, is developed. Each manipulative skill (throwing, rolling, catching, kicking, dribbling, bouncing, and striking with body parts and implements) is developed with attention devoted to specific body mechanics. Trust activities/group initiatives are introduced with the low-level elements of the adventure course. Tactical/group strategies of a variety of team sports are also introduced and rhythmic activities continue. Skills for modified team and lifetime sports also continue. And team competition is introduced during field day. Supported by their previous training, students in grade four demonstrate automaticity with the basic facts of mathematics. They are encouraged to continue to apply their understanding of models (arrays, equal-size groups, and equal intervals on a number line), place value, and properties of operations to develop and use efficient and accurate methods to multiply multi-digit numbers. They accurately estimate products and calculate them mentally and using pencil and paper. Students at this level also develop an understanding of decimal notation as an extension of the base-ten number system. They understand fractions and decimals as representing more numbers between 0 and 1, between 1 and 2, and so on. Students compare and order decimals and, by working with decimals, they extend their ability to recognize equivalent fractions. They recognize area as an attribute of two-dimensional regions, and understand that a square unit is the standard unit for measuring area. They build on their earlier work with symmetry and congruence to encompass transformations, including line and rotational symmetry. As part of understanding two-dimensional shapes, students measure and classify angles. They also continue solving problems by using and making frequency tables, bar graphs, and picture graphs. They apply their understanding of place value to develop and use graphs, such as stem- and leaf-plots, and they are introduced to hands-on equations as a concrete method to solve algebraic linear equations. Students in the fourth grade apply various reading strategies to enhance comprehension, make their thinking visible as they write down ideas, and make connections and ask questions while reading a text. They understand the features of texts (e.g., table of contents, titles, subtitles, captions, diagrams, graphs, index, glossary) and read at different speeds, using scanning, skimming, or careful reading for different purposes. In order to increase the mastery of phonics, word recognition, and different reading strategies and also to increase fluency and comprehension, students discuss literary elements and devices in stories, including setting, characters, plot, theme, mood, foreshadowing, personification, and metaphor. They distinguish cause and effect, fact and opinion, the main idea, and supporting details in non-fiction texts and in poetry. They also provide evidence from the texts to support conclusions and responses and summarize central ideas in informational texts. All students read a minimum of two independent books per trimester while maintaining an independent reading log. In writing, fourth grade students publish five to seven individual and/or group works, using a variety of methods to organize information. They also enhance fluency in writing through the use of transitional words and phrases to connect ideas and present their work in complete sentences. They apply elements of grade-appropriate guidelines to improve and evaluate their writing. The students produce writing in the following genres: reflection, narrative, expository, descriptive/creative, and persuasive. Students spell grade-level high-frequency words correctly and apply knowledge of word families, spelling patterns, and syllabication to spell new words. Students use notes and other aids to memorize a short presentation and learn to employ techniques to maintain audience interest during formal presentations. They incorporate adequate volume, proper pacing, and clear annunciation while incorporating peer feedback and teacher suggestions for revisions in content, organization, and delivery to their presentations. They also build vocabulary through their increasingly sophisticated understanding of other subjects and an ability to recognize compound words, contractions, and other common abbreviations. In their own words, they utilize and define the meaning of words learned in literature, social studies, science, and math. And they infer word meanings from root words, and use words, sentences, and paragraphs as context clues to determine meanings of unknown key words, similes, and idioms. For fourth-grade students, the use of the library, technology, and media continues to be integrated with classroom projects and lessons. Fourth-graders use a variety of media and formats to communicate information and ideas to multiple audiences. They locate, organize, analyze, evaluate, synthesize, and use information from a variety of sources and media with increasing independence. They also continue to process data and report results using an increasing variety of sophisticated tools. At this level, the students’ use of technology and media expands to include the selection and use of diverse applications, including word processing functions, graphing, and multimedia presentation platforms, as well as collaborative learning environments, such as wikis and blogs. Students also learn and practice safe, legal, and responsible use of information and technology by understanding of the meaning of plagiarism and the importance of copyrights, network etiquette, and Internet safety. As part of their study of geography, fourth-grade students learn to identify states and colonies within specific regions as well as the states immediately surrounding New Jersey. They demonstrate this knowledge through the use of ordinal directions (northeast, southeast, northwest, southwest) and learn how to find exact locations using latitude and longitude, identify each of the continents and all the oceans, and identify the hemispheres, poles, and the equator. In their study of history, fourth-graders learn about the culture and customs of the Leni Lenape Indians as well as several other Native American regions. Furthermore, they understand the reasons for the movement of explorers, settlers, and colonists. They will also understand relationships among the major events, the chronology, and the people of the settlement and colonization of America up to the American Revolution as well as the history of the people of New Jersey. Students will also learn how governments are used, and how they are formed, as well as the basic elements of local and state governments. In their unit on physical science, students in grade four study magnetism and electricity through a variety of means. Not only do they observe the interactions of permanent magnets with other materials and construct open, closed, parallel, and series circuits, but they also differentiate between insulators and conductors, construct an electromagnet, and observe that magnets display forces of attraction and repulsion. In their life science unit, students at this level focus on the human circulatory system by learning appropriate terms to describe the structure and function of the circulatory system. They also identify chambers and main blood vessels and trace the flow of blood through the body. To further their knowledge of life sciences, fourth-graders classify the vertebrates and invertebrates of the wetlands, identify the adaptations of its plants and animals, and identify food webs in the wetlands biome. Students also use a microscope and learn to understand its functions and proper use so that they can prepare wet mound slides. In earth science, students study rocks and minerals using measuring tools to gather data about rocks so they can categorize them according to their method of formation: igneous, sedimentary, and metamorphic. The also use the tools to differentiate between rocks and minerals, sort minerals on the basis of property, and understand that rocks are mixtures of minerals. Further, students are expected to have a working knowledge of the solar system and astronomy as well as know the correct order and names of planets, recognize constellations as star patterns, and describe the life cycle of a star. After reviewing their previous year’s studies, fourth-grade students begin to identify basic kinds of classroom items in Mandarin. They learn how to articulate and find out to whom an object belongs, and they acquire knowledge about Chinese calligraphy and character writing. Students begin to learn to read and practice writing Chinese characters. They also learn about Chinese names and will begin to learn Pinyin, the Chinese pronunciation system. They gain knowledge about the grade structure in an elementary school in China, learning the ways to ask and respond to questions about the grades in a school. They also learn to respond correctly to basic Chinese classroom expressions. In Spanish in the fourth grade, the emphasis on recognizing grammar patterns through speaking, listening, reading, and writing skills increases. Students continue to write simple paragraphs and more complex sentences as they develop a broader vocabulary. They learn to spell, punctuate, and capitalize correctly. When reading Spanish, students learn how to identify characters and their roles and understand written instructions. In fourth grade, students reinforce their knowledge of note names of the lines and spaces of the treble clef through singing and playing the recorder and keyboard. Students continue to study and play the recorder individually, in small groups, and as a class. They also complete a composer unit on Johann Sebastian Bach. In addition, students focus much of their energy on preparation for performances at the Holiday Concert, Grandparents’ Day Concert, and Closing Exercises as well as their grade-level play. Throughout the year, students experience through performance and listening many forms and styles of music as well as explore creative movement. In their fine arts classes, fourth-grade students increase the use of details to make a work of art more interesting. They understand and apply the concept of realism; recognize the basic forms used by sculptors, such as “in the round” and relief; detect the abstract nature of things through visual experimentation; and understand the role of experimentation as an outlet for the imagination in an artist’s life. With their growing body of knowledge, students understand the influence of color keys on moods or feelings in works of art, they understand how to apply light and shadow, and how to identify themes in various types of works of art, such as landscapes, portraits, and still life drawings and paintings. Students also create the illusion of movement through patterns. In fourth grade, students prepare a Spanish music video. They continue to develop the skills of vocal projection and inflection. They also portray a variety of emotions by using proper diction as well as moving naturally on stage, making eye contact, and memorizing dialogue. Fourth grade is the first year our students change clothes for their physical education classes. In this year, students continue to develop locomotor and manipulative skills as they learn and practice such skills as kicking, dribbling, and throwing with force, speed, and accuracy. By playing games and sports, fourth-grade students better understand the importance of moving to open spaces on the field of play, the basic concepts of offense and defense, the basic positions of players in team sports, and the importance of demonstrating support for teammates. Students at this level are also charged with creating sport activities and games of their own through which they continue to demonstrate a sense of fair play, a respect for and proper use of equipment, an understanding of how to follow directions, and an acceptance of success or failure in competition. Students also focus on fitness, understanding the benefits of warming up for flexibility, strength, and endurance, identifying heart rate, pulse, and working heart rate, and assessing their level of fitness through challenge course participation. By studying a language students are exposed to a new world of understanding. The study of Chinese Culture and Language (Mandarin) starts in PreK and continues through eighth grade. Watch and hear students using their Mandarin skills.